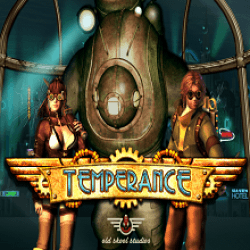 Temperance slot takes you down deep below the sea in a futuristic, steampunk-like world that is both eerie and pretty cool at the same time. It reminds me a lot of the lost city of Atlantis, but rather than being a perfect Utopian paradise that has sunk to the bottom of the sea, instead it’s a rather dank, built-up city. I think Microgaming have done an excellent job here in coming up with something original and it could really appeal to a lot of players who are looking for something a bit different. There aren’t a huge number of symbols here but it keeps the gameplay simple and suits me just fine. The Wild, as well as being the most valuable symbol, also substitutes for all other base symbols in a winning combination. Free Spins Bonus. This is triggered by 3 or more scattered Free Spins symbols, with 3 symbols offer 8 free spins, 4 offering 12 free spins and 5 giving you 20 free spins. To make the Free Spins Bonus even more exciting, you’re also given additional stacked Wilds to help you to get some extra wins. The Free Spins Bonus can also be retriggered with the same number given as the number of symbols that trigger the game. And finally, a multiplier is also offered to every free spin including the retriggered free spins. Survival Bonus. This is triggered by 3 scattered bonus symbols on reels 1, 3 and 5. This is a multi-stage pick game that has up to 5 different levels with various wins. The Win-All items give you all the prizes in the current level and will advance you to the next level. The Advance items will also advance you to the next level but will not award you any prizes from that level. Lastly, the collect items will give you a prize but unfortunately end the bonus. Gamble Feature. This is an optional feature that’s becoming more common in slots nowadays. It’s available during the base game after any win and gives you an opportunity to double your winnings or leave with nothing, with the odds being 50/50. You can end the feature at any time before the wager is placed, and it will end after 5 consecutive gamble wins in any one sessions, or after losing a wager. 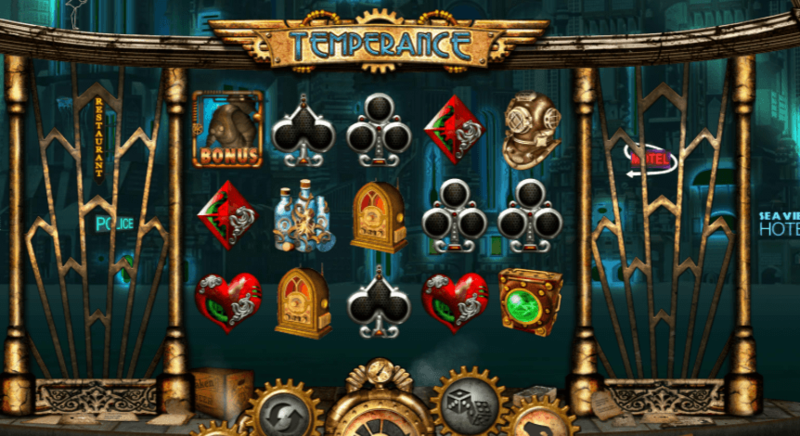 Temperance slot is a very cool slot from Microgaming with a really unique theme that stands out and will definitely appeal to a lot of players, especially those who are a fan of steampunk. The level of detail in the game is pretty spectacular, and it really helps to immerse you into the slot. The bonuses are fairly standard including free spins and a gamble feature, but they work well and can offer fairly substantial rewards. All in all, this is a great game that I recommend purely based on the design alone, but the other aspects of the slot certainly don’t disappoint.